ASP Dream Girls sang “Angels Brought Me Here” for guests of DOC on TV, during the 3RD Anniversary Celebration of UNTV, the Public Service Channel last November 28, 2010. Joining them were ASP Chair Emeritus, Dang Koe and Trustee, Ging Viado. 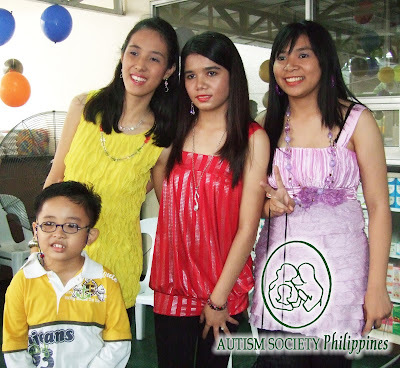 Other special guests included the Down Syndrome Association President Elmer Lapeña and wife Agnes. SPARKLE Band’s Patrick Oliver Ulanday, child with Autism, also gave the show’s opening number Jingle Bells and Silent Night on keyboards together with mentor, Teacher Raymond Lee. ASP Dream Girls: Thara, Nica and Vell while sings “Angels Brought Me Here”. Applauded by Dr.Daisy Camitan, Dr. Edwin Bien and Dr. Ato Basco. and Chair Emeritus Dang Koe were interviewed about ASP and autism by Ms. Yasuy Muralla and Dr. Edwin Bien. ASP Dream Girls with SPARKLE Band’s Patrick Oliver Ulanday. Doc on TV is hosted by Dr. Edwin Bien, a US-trained integrative medicine practitioner, and, Ms. Rhea Horrileno, a friendly pediatrician. The show airs every Sunday from 7 to 8am. The station also conducted a medical mission for children with learning disabilities at Elsie Gaches. Congratulations UNTV for extending your public service to children with disabilities.